In advancing our mission, we strive to anchor all of our educational programs to nature. One great way is to lead the activities themselves in the natural world. Through place-based learning, our audiences are immersed in the content itself. Our school programs at Neary Lagoon and Pogonip are great examples. 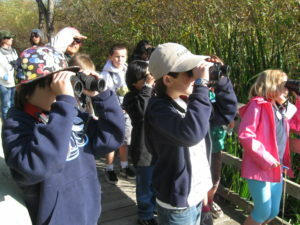 These terrific partnership programs with the City of Santa Cruz engage students in the natural world through real experiences in our own community’s open spaces. On these trips, important classroom concepts come alive for students, through direct and meaningful engagement in nature. We also offer a variety of public programs anchored in nature, including our guided walks in local open spaces, our nature sketching classes and our DIY outdoor workshops. This month, we have several nature-based opportunities designed to build better understanding and appreciation of our local wonders. 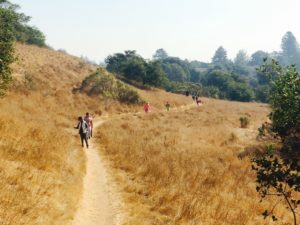 On Nov. 11, Elise Knittle, Professor of Earth and Planetary Sciences at UC Santa Cruz, will lead a walk called “History in the Rocks: A Guided Hike of UCSC.” Professor Knittle will help us explore the geology of the campus and greater Santa Cruz area — geology that tells a fascinating story about the landscape and its relationship to the ocean hundreds of millions of years ago. Just a week later, on Nov. 18, Kate Jaffe, a natural history and wilderness self-reliance youth educator in Santa Cruz, will join fellow artist Kris Nardello in leading a Natural Dye Workshop in the Museum’s garden. The workshop will demonstrate how to use plants, minerals and other materials from nature to dye fabric and make beautiful garments. And for Family-level and above Members, Education Director Felicia Van Stolk will lead a special tide pool walk at Bean Hollow in Pescadero this Saturday, Nov. 4. It will be a fun opportunity to learn about intertidal life in its natural habitat, right at the edge of the Bay. I hope that you will join us for one — or all! — of these upcoming learning adventures. Each will provide an interesting new way to examine the world around us.